서울 드랙 퍼레이드는 전 세계적인 퀴어 인권운동이자 문화활동인 프라이드 퍼레이드와 한국의 서울 (및 다른 지방의) 퀴어 퍼레이드에 영감을 받아 2018년 5월 26일 토요일에 처음으로 개최 될 퍼레이드 행사입니다. 서울 드랙 퍼레이드의 목적은 다양한 퀴어인들, 더 나아가 모든 개인이 드랙이라는 매체를 통해 자신의 정체성을 찾아가고, 본인의 감정과 생각, 스타일을 진실되게 표출할 수 있게끔 장려하는데에 있습니다. 서울 드랙 퍼레이드는 트랜스젠더는 물론 그 누구도 개인의 성적 지향, 성 정체성, 드랙 스타일이 원인이 되어 차별받는 것을 절대 용인하지 않습니다. 퍼레이드 및 모든 관련 행사에는 드랙 아티스트들 뿐만 아니라 모든 퀴어와 앨라이가 참여하실 수 있습니다. 서울 드랙 퍼레이드의 페이스북과 인스타그램을 팔로우 하시면 다양한 정보를 빠르게 업데이트 받으실 수 있습니다. 네온사인과 디스코볼이 빛나는 밤에는 물론, 햇살이 우리 얼굴을 비추는 낮에도 드랙드랙하고 자부심 넘치는 모습으로 빛나봅시다. 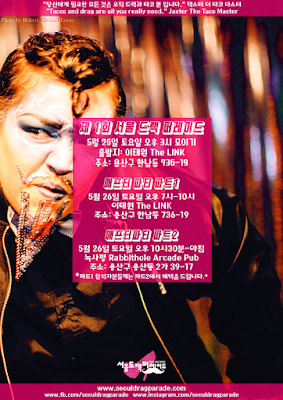 서울 드랙 퍼레이드에는 드랙 아티스트들뿐만 아니라 평등과 사랑을 지지하는 모든이가 참여할 수 있습니다. ***미성년자는 부스행사와 퍼레이드만 참여가 가능하며, 애프터파티에는 참여하실 수 없습니다. 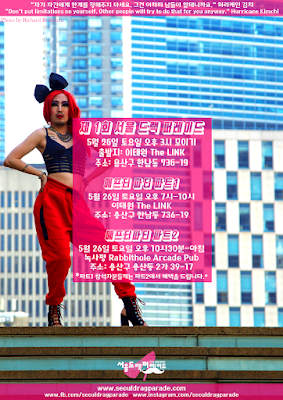 Seoul Drag Parade is a parade event that is inspired by pride parades from all around the world and Korea's regional queer culture festivals. 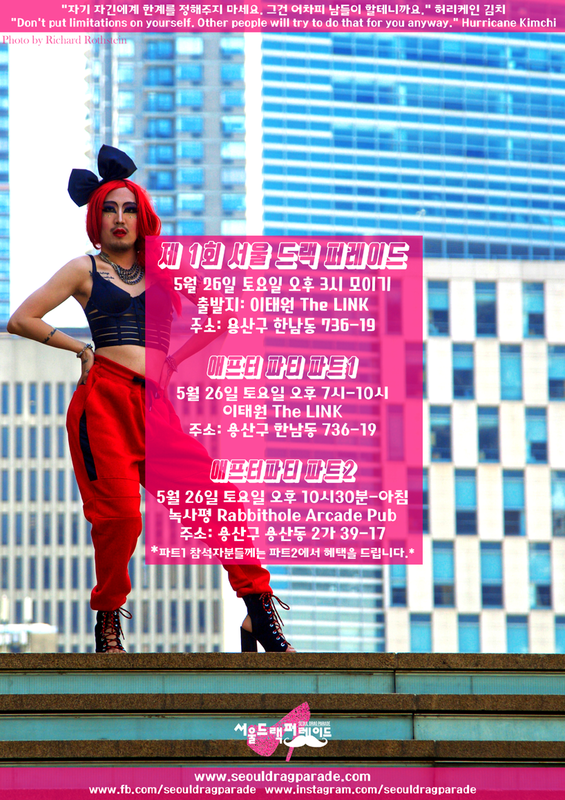 The ultimate goal of Seoul Drag Parade is to encourage (both queer and non-queer) people to use drag to go on a journey to find their identity, and become able to express their true feelings, thoughts, and style. 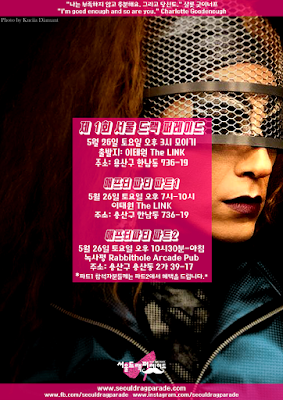 Seoul Drag Parade does not tolerate discrimination against transgenders, and any other individuals for their sexual orientation, sexuality, or personal drag style. All LGBTQIA+ and allies are welcome at the parade and related events. The first Seoul Drag Parade will take place on the 26th of May this year. Details about all the related-events are announced via our website and social media. Follow us on Facebook and Instagram to stay updated. Let us shine, not only at night under the disco balls, but also in the sunlight. Let us march with pride and love. Anybody who believes in the right to love equally can participate in this event, in or out of drag. ***Minors can only participate in the booth events and the parade. After-Parties are for adults only.